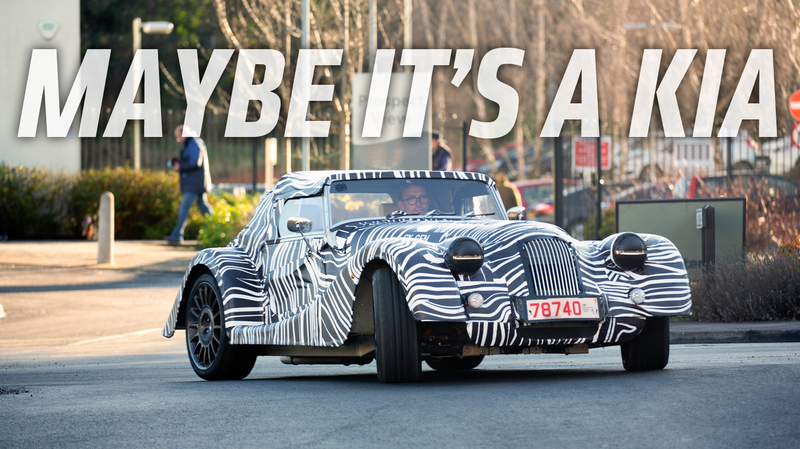 We see pictures of camouflaged pre-production cars all the time. Usually, it’s pretty tricky to tell exactly what kind of car it is, which is the entire point of wrapping the car in camo in the first place. But a Morgan? Why are they even bothering, really? It’s not like anyone is going to see this thing, no matter how much zebra-print camo they slap on it, and think, hey, is that the new Hyundai Elantra? Of course it’s a Morgan. In fact, this is the new “wide body” Morgan that’s expected out later this year as Morgan’s new flagship. This is expected to mean that it’ll be a BMW inline-6, as opposed to the V8s Morgan has been installing in its top-of-the range cars for 50 years. It’s also expected that the new platform will be designed to potentially accomodate batteries for a hypothetical future EV or hybrid version as well. Morgan also says the car will be the “most dynamically capable production Morgan ever,” which is always good to hear. Personally, I’m just delighted that Morgan still exists, and is still building cars that look like this.